The pope began his visit with a brief sermon delivered from the balcony of the Old Glory Amphitheatre, and blessed the park's many concession-stand workers who "provide sustenance for our brethren seeking to beat the heat." "My friends in Christ, as we stand together today among this unusually large weekday crowd, I urge you and your children to exercise the twin virtues of faith and patience, for unto those who wait will come great rewards and monstrous thrills," the pontiff told those in line for the Screamin' Eagle roller coaster. 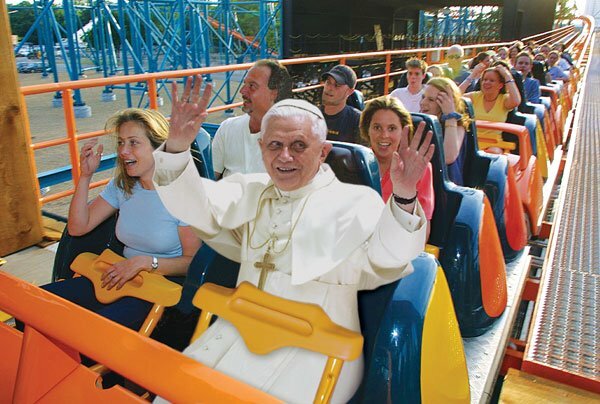 The pope was honored in a special ceremony outside the Warner Bros. Backlot, in which he was presented with a complimentary season pass, good for free entry at any Six Flags or Hurricane Harbor until August 31. SVILUPPO: Yes, some of the Onion's piece is in bad taste -- e.g. a photo of Benedict walking through the gate of Auschwitz now has Bugs Bunny in it. Of course, the majority of Onion readers wouldn't realize where the photo was originally taken, but: 1. nobody ever said satire was pretty and 2. this is all part and parcel of the church's place in the public sphere. That's just the way it is.